At our downtown Charleston hotel you will find our beautifully appointed Queen Guestrooms located in the Church Street Building. 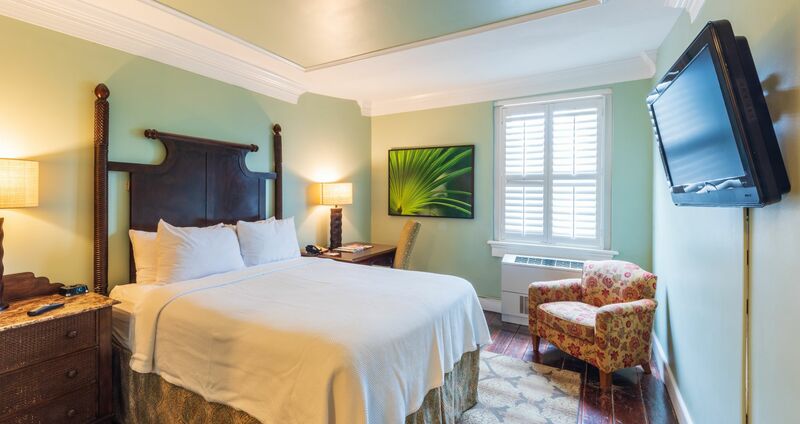 These modest sized Charleston, South Carolina accommodations reflect a traditional style in a soothing palette of blues and greens accompanied by modern amenities and plush queen bed. All complemented by lovely views of the magnolia-and-hibiscus charm on Church Street nestled in the heart of Charleston. Our boutique Queen Guestroom baths are highlighted with Italian Travertine porcelain tile, granite countertops, and spa quality Gilchrist & Soames bath amenities.